The Blue Train is our equivalent of the Orient Express. It’s a luxurious train journey where you languish in luxury while waited on hand and foot. Meals are taken seriously. Very seriously. You book either the early sitting or late sitting. They serve many courses of incredible food, all paired with wines and liquors to match. We did their off-season special and can only highly recommend the trip. 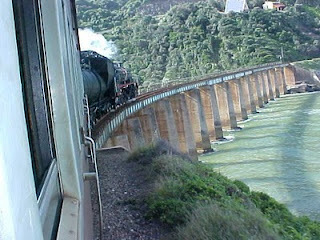 The train runs between Pretoria and Cape Town and the other way around. There is a stop in Kimberly to visit the diamond museum. If you are travelling the other way then you get to see the historical town of Matjiesfontein. The beautiful South African landscape is the view from your cabin. Another train trip worth taking is the Outeniqua Choo Tjoe route. The steam train no longer runs but you can drive or cycle the trip. The route makes its way through the gorges and valleys and along the coast of The Garden Route between Knysna and George. I also mentioned the Cape Town to Simonstown train trip in a previous post. From Muizenberg the trains runs right next to the ocean. You have lovely views of False Bay. Read more in this post – Simonstown train trip.